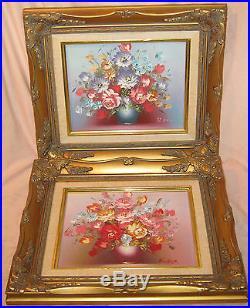 Pair of Vintage, AUTHENTIC signed ROBERT COX Original Floral OIL ON CANVAS Paintings. 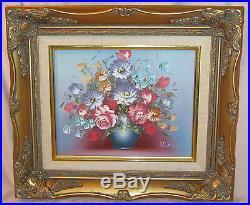 Roses, Chrysanthemums, and other flowers fill two similar, but differently colored vases, with complimentary backgrounds. 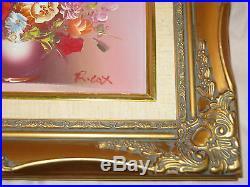 FRAMES are Matched EXQUISITE GOLD TONE Frames, Extremely Ornate and in excellent condition. 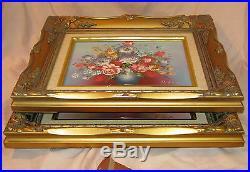 I would grade these frames at A. Canvases are great, with bright colors. These treasured oils were obviously well cared for, and protected. 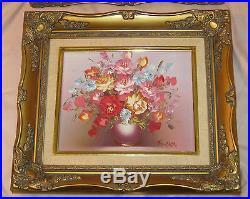 SIZE: Approx 15 1/2" by 13 3/4" by 1 1/2 thick FRAMES. Canvas area about 9 1/2"by 7 7/8". CONDITION: Keep in mind these are original VINTAGE, and may show unnoticed blemishes upon close examination. 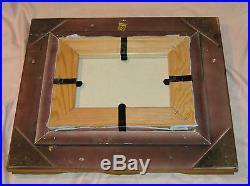 The back corners of the frames have a few small rubs/tiny blemishes, but will be against wall and most likely not visible. 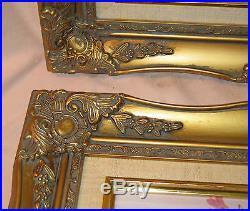 Keep in mind these frames are made to look like ANTIQUE GILDED FRAMES, so show dark"shadowing" and faux wear. These come from a smoke-free estate, and have no smokey odor. Please look at all the pictures. This matched pair of vintage Robert Cox oils will make a spectacular addition to your decor, and a wonderful investment in Art. And please check out all my other items listed. CHECK OUT my other books and items Listed, currently and in future. I list as much as, and as quickly as I can. If purchasing multiple items, PLEASE WAIT FOR MY INVOICE! !